Chinese warships are cruising off Palawan protecting their poaching fleet as it steals bounty from the Philippine seas. The Chinese are also lodged firmly on rocks just off Luzon, chasing Filipino fishermen away and caring not one bit if Filipino families starve. The reality is the reality, the Chinese are behaving thuggishly, and the Philippine war machine is a tinker toy. But there are not just two choices here, you know? It’s not a binary dilemma, wage conventional war or roll over and let the Chinese steal from the Philippines. Let me put two and two together here and see how it adds up. America faced a similar scenario back in 1775 when the British sucked taxes from the colonies and gave little back. The British war machine controlled the states with fancy armies powered up with the latest in guns and pretty uniforms with shiny buttons and polished black boots. But Americans redefined war by operating unconventionally. And Americans did the unexpected, hiding behind trees and sniping away at the pretty British whose dignity would not allow them to get out of their disciplined rows, or vivid shootable uniforms, to fight tree to tree. The Chinese have similar weaknesses to the British. Their fleets are a long way from home and are not easily supported. The fleets are large as they seek to intimidate which makes them unwieldy in crisis. Furthermore, the Chinese arrogance is like that of the British, a false shield of superiority. Filipinos once, not so long ago, toppled a dictator who had immense power. He controlled the military, the police and all the guns. The toppling was done by people totally unarmed with anything but their unity and their voices. They came together and roared. The Philippines has a lot of boats. I wonder what would happen if a hundred of them, small, speedy and unarmed, appeared right in the path of the Chinese fleet? What would happen if the power of peace met the force of military might? Staging would have to be well-planned, not a batch of out of control boats doing their own thing. Imagine a Philippine peace-fleet sailing from Palawan (Spratleys) and one sailing from Luzon (Scarborough). The peace-fleet would have to be unarmed to have the desired effect, put China in a box. The peace-fleet would cut any fishing nets or lines in Philippine seas, the right of any landholder to stop an intruder from stealing goods. Risk that China would run over boats rather than try to avoid them. Risk that China would open fire. Risk that accidents would occur. Video tape the entire exercise from multiple cameras. Put the eyes of the world on bullying, thieving Chinese aggression. If the fleet were unarmed, in Philippine waters, presumably the Mutual Defense Treaty between the Philippines and the U.S.A would be triggered by hostile acts from Chinese military ships. ARTICLE IV (part). Each Party recognizes that an armed attack in the Pacific area on either of the Parties would be dangerous to its own peace and safety and declares that it would act to meet the common dangers in accordance with its constitutional processes . . . If the operation remains substantially civilian and unarmed, the Chinese cannot argue that they were attacked militarily. It becomes a matter of the Filipino people exercising their rights in Filipino waters to preserve Filipino resources. A sea-based Edsa rally. Is China foolish enough to attack substantially harmless, unarmed citizens of the Philippines? Are Filipinos passionate about defending their seas? Acts of sabotage against Chinese ships. The objective would be to make these incursions so costly to China, either materially or in reputation, that she would stop stealing the Philippine’s economic future. It could be a long, drawn-out, contentious affair. Or it could end quickly if China opened fire and the U.S. did not respond in kind, or if China finally got perspective and withdrew. The fundamental objective is to remove Chinese vessels from Philippine waters, or portray vividly and visually that China is an arrogant, thieving thug willing to run over poor and peaceful states in order to steal their goods. And to use China’s humiliation before the world to stop her aggressive behaviors throughout Asia. And perhaps encourage other states to place economic sanctions on China. China CAN be a responsible and peaceful leader in Asia. But she has to grant other states the right to resources that international convention says belong to them. China cannot consign the rest of Asia to starve while the Chinese dine high on the hog. Or on the poached anteaters, fish, turtles and anything else this conscienceless state sanctions grabbing . . .
Are you suggesting a maritime Tiananmen type of mass action in 2.3? I think it can work. Yes. The power of peace against the obscenity of war machines. Great. I suggest you look for a photo or photoshop one of a small boat standing up to a battleship. Powerful imagery, like that civilian in front of a tank. Good idea. Maybe I’ll use one of those putt-putt fishing outriggers against the Chinese aircraft carrier. And the tank rolled over the demonstrator. The peace fleet sounds like a good idea except it is dependent on the Chinese communist government having the same value for human life as we do. As to activating the MDT, it won’t because the territory under consideration is disputed. Even winning a case in UNCLOS will not help if the Chinese refuses to abide by its verdict. What we have here is the classic Theocydides line about the powerful can do what they please and the weak have to live with it. What we have to find is our own power, not necessarily military power because that kind of power does not really solve anything. Has military might or superiority ever brought lasting peace other than lulls between wars? Agree. I think the power is a combination of peaceful protest of China’s acts and specific economic punishments. Alas, Asia is a very divided region and China is good at keeping it that way. So economic punishment is hard to generate. The map that josephivo has linked to below is fascinating. Maybe a party of three could develop some protocols for sharing resources: Vietnam, Malaysia and the Philippines. A governing triumvirate. Let them set the rules that China and Taiwan must abide by. It’s a rat’s nest, for sure. Interestingly, if you take the red pins out of the map (China), the remaining parties could wrap up an agreement on boundaries in about an hour. It seems that although, poorer nations, ASEAN are better at diplomatic resolutions than East Asia. Even Japan, Korea, China and Taiwan are constantly bickering about maritime and islets “sovereignty”. Yes, I might write on this some more. Maybe “Joe’s Agreement to Parcel out the Spratleys”, something all nations will agree to. Well, the one’s who believe in peace and common sense. Now I’m seriously thinking of going home and buy my boat to be with the protest. Reminds me of EDSA people power, this time WEPS (West Philippine Sea) boat people power. Thanks Joeam. Hi, Sandman, welcome to the blog. Yes, and I would happily fund a boat or two, gas and snacks and a night or two in Palawan, but I get seasick. Army guy, worthless on water. Not a bad idea… Hamas uses the same tactic (albeit to shield their firing points from Israeli bombardment) with some success. Very recently, Japanese civilians used the tactic to occupy their own “disputed” islands. In the case of the Philippines, I think it would be a perfect opportunity for people to start WALKING THE WALK instead of just talking the talk. Yep. That is the singular reason for the line in the article as to whether Filipinos have the passion to defend their seas. If they do, I’m behind them all the way. If they don’t, I can stop caring. My suggestion would be relocating the informal settlers to the Philippine-held islands in addition to unarmed boats you suggested. A Chinese attack on a non-military settlement in no way make them look good. The Philippines also solves partially the problem of informal settlers in urban areas. LOL! Some time ago I had recommended that the Philippines set out to develop and inhabit all inhabitable islands. I’d do it with volunteers, fisherfolk, mainly, but offer financial incentives. It is rather a vulnerable, isolated way to live. Or rotate people through, quasi military. Not relocation of informal settlers. LOL! That’s killing two birds with one stone. May I suggest another bird: the useless members of Congress. This is a nice idea, maybe in cooperation with Vietnam and Malaysia? Looking at the Spratly map with the current occupiers (http://maps.google.com/maps/ms?ie=UTF8&hl=en&msa=0&msid=112047810770307867127.0004460b96d655257cc9c&ll=11.070603,115.708008&spn=9.563619,20.566406&t=k&z=6) it seems a mess. Logistics, 200 to 400 km out of Palawan, 10 to 20 hrs sailing and 10 to 20 hrs back…and aren’t the Chinese able to sail at double the speed? 750 islands and reefs, that are plenty of opportunities for them to change tactics. Wonderful resource. Throws a dose of reality on the picture, at how complex the cross-interests are, and the ample presence there now on various occupied islands. 1) Information is critical, knowing not where the ships are, but where they are going. 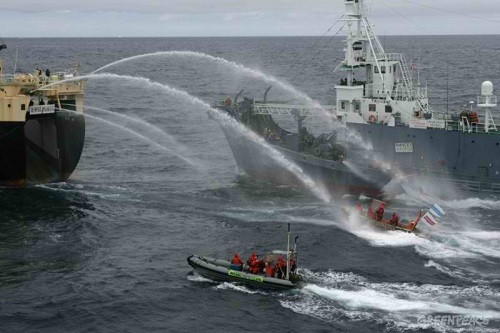 2) Perhaps hire a Greenpeace expedition organizer. The information means that goals have to be crystallized: (1) get military ships out of these contested waters, (2) set PR goals: the need for a shared agreement; China’s one-on-one does not work. What does the Philippines expect? To push Viet Nam and Malaysia out of the Spratleys? Or Taiwan? What in the world is Taiwan doing claiming islands in the Spratleys? Which rules? History or occupancy or rules like UNCLOS? Clearly the thinking has to be better and deeper than I’ve put out here. IMO, the historical claims of both Taiwan and China is absurd. According to them, their “fishing rights” go back to the 12th century (Yuan Dyansty which is basically Mongol empire ruling China). One problem here is that the Austronesian people are maritime people(which is why we are spread all over the Pacific area, we love living in islands. LOL) in which sailing and fishing is a tradition long before the 12th century. ASEAN countriesm esp, the maritime countries have been navigating those waters even before the Yuan Dynasty…so China’s argument based on “historical claim” and usage is absurd and a very bad lie. If we base their claim on their argument, maritime Southeast Asian nations win. In addition, we have another crazy op ed saying that Batanes was never part of the Philippines! I think Taiwan is starting to be hell bent in pursuing Batanes and making it a “disputed area” like they did to Senkakus! Vietnam, China and Taiwan claim history is on their side, but history is a flimsy basis. The French owned those islands when they controlled Viet Nam, so soon, I suppose, France will want a piece of the action. And for sure Taiwan is defining her own reality on this, and fitting Batanes into it is just another piece of nonsense they might claim as legitimate. Taiwan appears to be following the Big China model, for sure, of setting commonsense and civility aside for self-gain. Also, I was going to promote this blog to a fishing advocacy group, but could not readily find one. No wonder fishing is so out of control. No glue. Also no sponsor for such an activity as proposed here. They might. Their boats would have to travel a long way while Philippine boats can run sorties from Palawan. Global “indignation” would be the goal. Great word for it. You maybe the next face that could launch a thousand ships Joe…if Filipinos muster enough cojones! 🙂 “The face that launched a thousand ships . . .” From a poem by Christopher Marlowe describing Helen of Troy, who was abducted by Paris, thus setting off the Trojan Wars as a thousand ships were launched to bring her back. I had to look that up. I don’t know who wrote the poem about cojones, but I think he was Mexican . . .
i’m thinking of posting this on facebook as a public post at night so your idea will spread. I think appealing to worldwide public opinion is more forceful than the UN tribunals which are toothless. Yes, I agree public scorn is one force that can make China take notice. Arguments of reason will not, nor will arguments of consideration of others, nor even arguments of law, if there is no court to adjudicate or way to enforce (UNCLOS). Let the idea run free . . . good . . .
Great idea. Joe, is it alright if I spread the word so it would reach the proper “ears”? Yes, for sure. I stake no claim to the idea and if it helps, great. Call me anything you want…but this post really brought some tears. Peace Fleet vs. Warships. Please allow me to repost on my blog. Post away . . .
Great Idea, i hope our government will review your suggestion. Just one thing, what if the Chinese send a great number of civilian boats as well to match our peace fleets? They’d have to come a long way. I’d retreat to Palawan with the civilian boats and send Coast Guard ships out to arrest poachers in Philippine waters. If China sent out warships to drive off the Coast Guard ships, I’d dial up Barak Obama. So much for peaceful protest, eh? Details are sketchy..did they just break bottles..did they rob the area? I find it too odd that they’d just go breaking stuff…. It is peculiar, I agree. Maybe this message will not reach our fisherman, and no action will be done if there is no one will lead them. Everything of this article is a good idea but our problem how we shall execute them to meet there purpose. Hi, Z. Good of you to stop by and, indeed, you zero right in on a huge question mark. Who will put it together? Another is timing, is it now or after all legal appeals to the UN/courts are done? If the ruling is in favor of the Philippines, that would give such a rally even more “peace power”. I don’t think there is great urgency. Maybe a leader will bubble up . .
You have a good point sir. But the last thing I know the vietnamese fishermen tried to defend Hainan and the Chinese still fired at them thus triggering a war between Vietnam and China. I just hope when my country does it in huge numbers the Chinese will think twice before firing. Indeed you said there is a probability of death. But I hope if China committed such crimes he will be sanctioned internationally. Yes, Aristeo, you bring a dose of reality to the scene. China is pushing everyone in Asia now because she gets no pushback. I’m doing another blog now on the Spratleys (for next week), and China’s occupation there is substantially military. Also, the Philippines is considered one of three “running dogs of the US” (Japan and Viet Nam the others) and “you only need to kill one” to get the others in line. That is from a high ranking Chinese military man. So indeed, they’d probably shoot because the Philippines is weaker than Japan, and they’d like to teach a point. The Philippines then becomes like the guy who stood in front of the tank. Highly vulnerable unless someone bigger pushes back. I’m actually glad that Japan is reaching out to the Philippines in this matter. They gave the Philippines soft loans to have 10 new Coast Guard ships… I read that it is part of their agenda to help strengthen the Philippines to counter balance China. 70 years ago, Japan was Asia’s enemy, not it is Asia’s “champion”(sort of ) and the once Western ally, China is now where Japan was in its militaristic heyday. Indeed, in the world of geopolitics, there is no permanent friend or enemy. Yes, I don’t know when such recognitions took place. Viet Nam had no real friends at the time, though, having shucked China and won over the US in battle. An important point, the incident was a face-off of military on military, not military on civilian. The type of confrontation I am envisioning is not a military face-off. Indeed, that is what should be avoided. Incredible video. Shocking inhumanity. And the Chinese brothers on Taiwan are railing about the Philippine Coast guard policing act? Maybe they ought to look within, at their culture’s values. How can we have Fox News or CNN cover this issue so that the whole world will see the Chinese encroachment and greediness at the West Philippine Sea. The potential 27 trillion dollars of oil, natural gas and other resources is the main reason that China is aggressive in claiming what is not theirs. The Filipinos need heroes and you Joe America will be one of them who can elevate the issue. To me you are the personification of “The Beautiful American” Joe. From a young man with a good brain and his own passion for the Philippines, I take that as quite a compliment. Thank you.